Merry Christmas Eve! I’m sharing one last recipe before Christmas, and cutting it kind of close, I know! But I couldn’t let the season go by without sharing this easy recipe for Festive Pesto Pasta Salad. So I’ll keep this post short and sweet today because I know everyone has a bunch of things to do before the big day tomorrow. And by a “bunch of things” I hope that doesn’t mean you’re shopping at the mall. I hope it means you’re busy visiting family and friends and celebrating with good food and tasty beverages! I love having everything done before Christmas Eve. It’s my favourite day of the year, so I just want to sit back and enjoy it. Our plan for today involves relaxing by the tree in the morning with endless cups of coffee and visiting family and friends in the afternoon and evening. What are your plans? Our morning tradition also involves assembling a gingerbread house! I would really like to say that we make a gingerbread house from scratch, but I’m nowhere near that patient. So we buy a pre-made package and just assemble and decorate it. It’s super fun, even if the house isn’t really edible! Next year, I may try to make my own. And if I do, I will definitely follow the recipe and instructions by my friend Katherine at Love in My Oven. She posted her DIY Gingerbread House recipe last week and she made it look so easy and delicious. You should definitely check it out! It might seem strange to share a salad recipe on Christmas Eve. After all, isn’t this the season of cookies, appetizers and beverages?! It is, indeed! But my Christmas Day and Boxing Day also involves pairing leftover turkey and ham with salads. And my contribution is always a traditional macaroni salad. But this year, I’m breaking with tradition and whipping up something new! 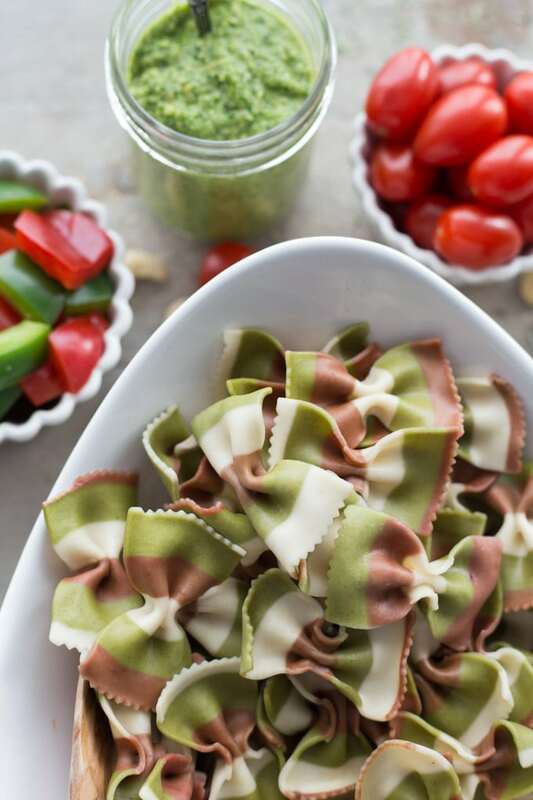 I’m a huge lover of pesto, and when I found this red, white and green bow-tie pasta, I knew I had to make a Festive Pesto Pasta Salad. The pesto is a version of my creamy kale pesto, but it’s a little less creamy and a bit more chunky. The consistency works really well in this pasta salad. Once the pesto is made (which you can prep ahead and store in the fridge), you just need to cook the pasta, add some red and green veggies (festive, right?!) and mix in the pesto. Voila! 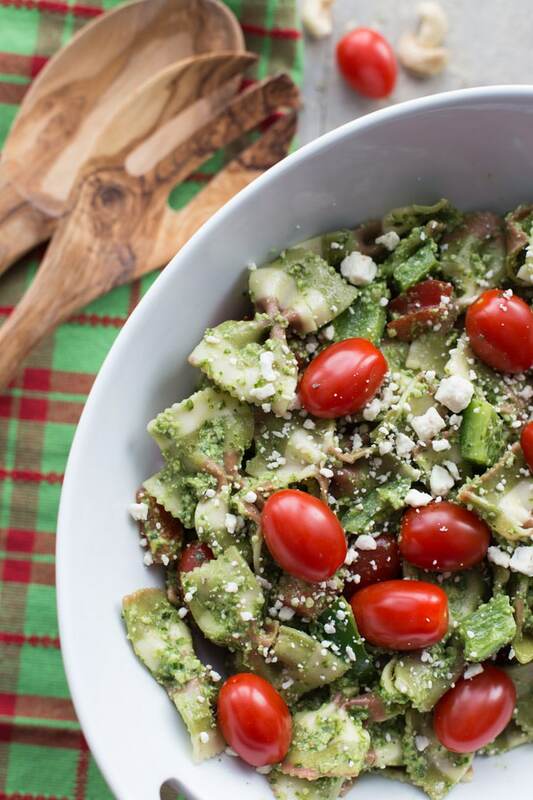 Your Festive Pesto Pasta Salad is ready to go! This salad is definitely making it to my Christmas Day and Boxing Day gatherings. Hope you find a reason to make it too! Before I end this post, I just wanted to wish you all a very Merry Christmas! I’ve enjoyed my first nine months of blogging, and you guys are such a huge part of that! Thank you for visiting the blog, trying my recipes and reaching out to me, either here or on social media! 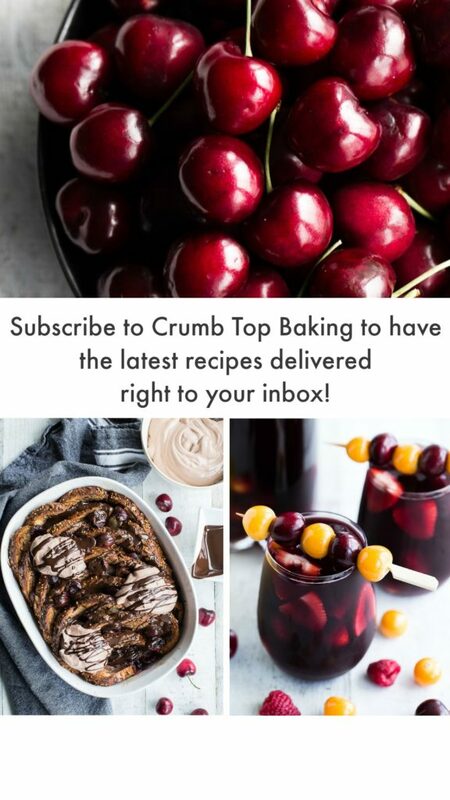 I love connecting with you guys, and it totally makes my day when you react to or make one of my recipes! Have a safe and wonderful holiday celebrating with family and friends! I’ll have another post for you next week before 2017 ends!! 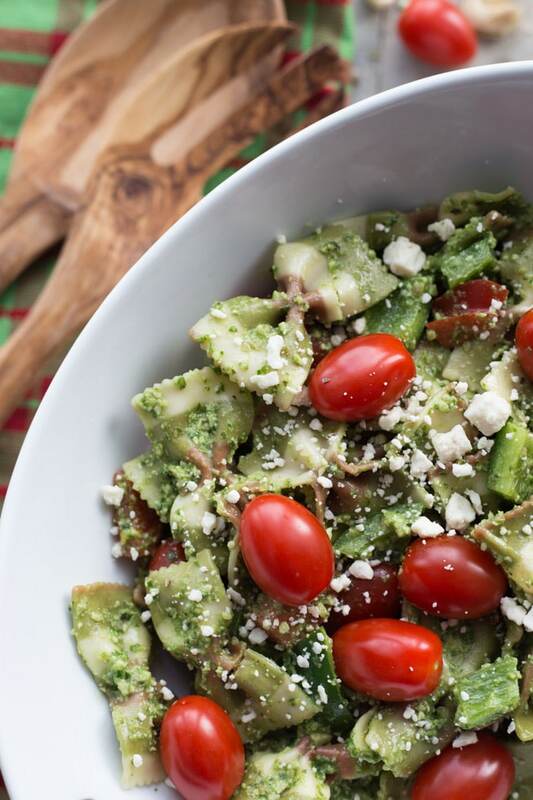 Festive Pesto Pasta Salad makes the perfect side dish for the holidays and pairs nicely with leftover turkey and ham. Packed with kale, cashews, sunflower seeds, tomatoes, and peppers, this is a healthier spin on a traditional pasta salad! 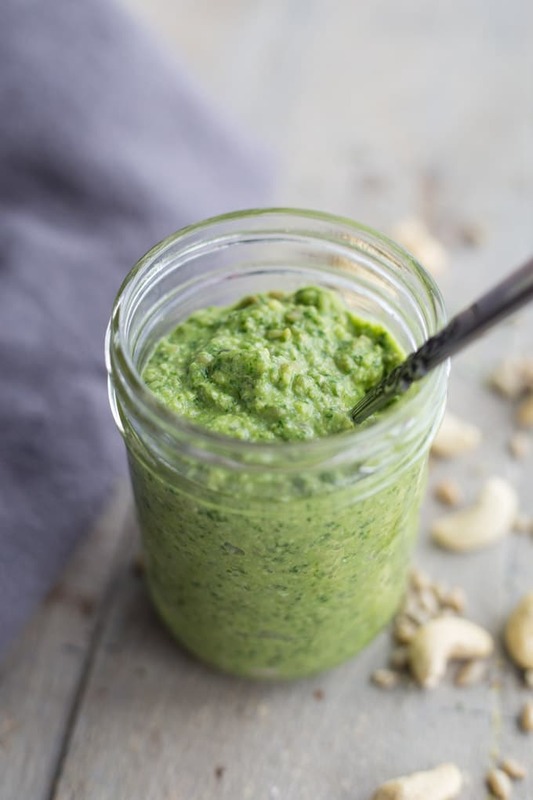 For the kale pesto: In a food processor, add the kale, cashews, sunflower seeds, basil, nutritional yeast, salt, garlic and lemon juice and pulse until it forms a chopped mixture. With the processor on low speed, drizzle in the olive oil. Process until blended but not creamy. The pesto should still have small bits of nuts, seeds and kale in it. For the pasta salad: In a large bowl, add the cooked pasta, tomatoes, peppers and pesto. Stir until well combined. 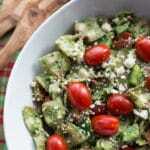 Place in a serving bowl and top with feta cheese (and a few additional tomatoes if you wish). Store any leftovers in an airtight container in the fridge and enjoy within 2-3 days. If you don’t have bow-tie pasta, you can use another type of pasta such as rotini, penne or macaroni. You can make the pesto a day ahead and store it in the refrigerator in an airtight container or mason jar until you are ready to assemble the salad. Festive indeed! Can’t wait to try. Pinning! Oh my gosh. I’ve been on such a pesto kick lately. This sounds DELICIOUS! I hope you had a fantastic Christmas, Leanne! Thanks Kelsie! It was a great Christmas! Looking forward to New Years now! I can totally relate to the pesto kick! I can’t get enough of it lately! Happy Holidays! I’m a huge fan of pasta and it can go in anything, especially salads!! 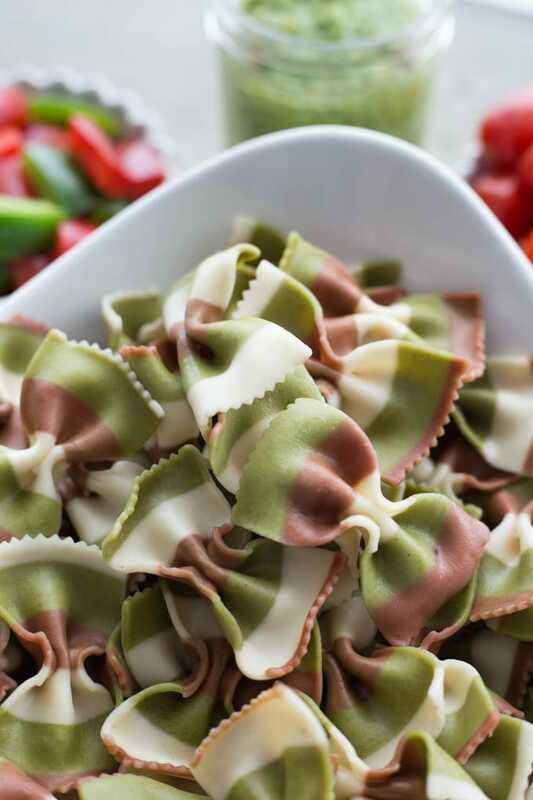 Love the addition of pesto sauce and feta cheese in that cute bowtie pasta! YUM!! Hope you had an awesome Christmas Leanne! Thanks Kim! The pesto in this salad is so good! I had a great Christmas! Hope you did as well. Happy New Year. Oh my gosh that’s the prettiest bow tie pasta I’ve ever seen! I’d hate to sauce that up and cover it up. haha . 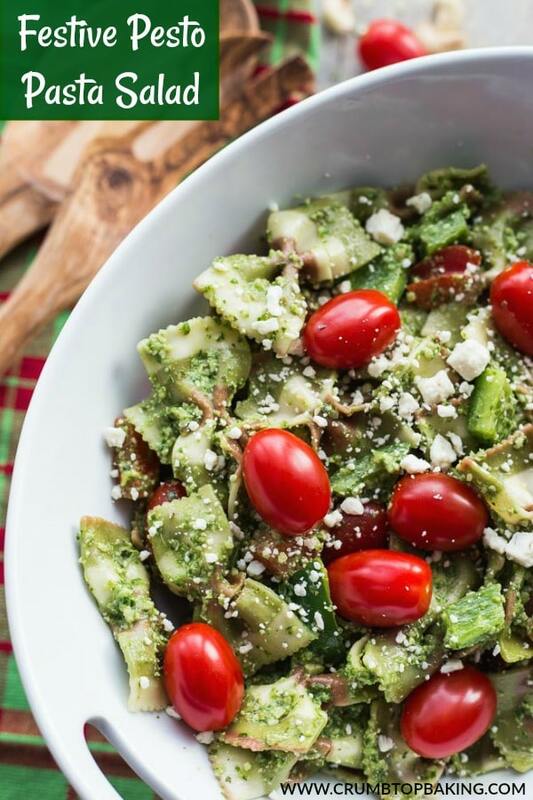 This salad is just perfect for the holidays with those vibrant colors and pesto is one of my favorite things! I hope you had a wonderful Christmas and Boxing Day Leanne! Thanks Marcie! It was a great Christmas (and Boxing Day!). I hope you are enjoying the holidays too! Believe it or not, I felt the same way about the pasta. I thought it was so pretty, I was really hesitant to cover it with pesto! But the red and green peppers and tomatoes made me feel a little better! It all turned out pretty festive looking! Thanks Katherine! It’s a fun tradition for sure! Looking forward to trying my hand at your DIY recipe next year. Hope you had a lovely Christmas too and all the best in the New Year! Thanks Dawn! Great connecting with you! Can’t wait to see what you cook up in 2018 as well! Happy New Year! Phew, I was a little nervous about this recipe until I read you didn’t make the pesto with pine nuts. I LOVE storebought pesto made with pine nuts but anytime I make homemade pesto with that nut, I can’t stand it. The pine nut is too overpowering or something. Maybe I’ve been buying off-brand, nasty pine nuts? However, I’m all about homemade pesto made with sunflower seeds and cashews!! YUM! You know what, I’ve never made pesto with pine nuts! To be honest, any time I look at buying them, they are just too expensive. So I prefer to make pesto with more affordable seeds and nuts. Hope you get a chance to give this one a try Christina! Have a great week!